What do BBC journalists think you should be reading? Among the recommended reading on the current hostilities in Israel and the Gaza Strip which BBC employees have recently promoted to their followers on social media is an article by Jeremy Bowen in the New Statesman. In that article Bowen makes no attempt whatsoever to adhere to those famous BBC values of accuracy and impartiality. Moreover, he further amplifies the line he already began promoting whilst on the ground in the Gaza Strip, claiming that he saw “no evidence” of Hamas’ use of the local population as human shields. “I was back in London for my son’s 11th birthday party by the time all those people were killed in Shejaiya. But my impression of Hamas is different from Netanyahu’s. 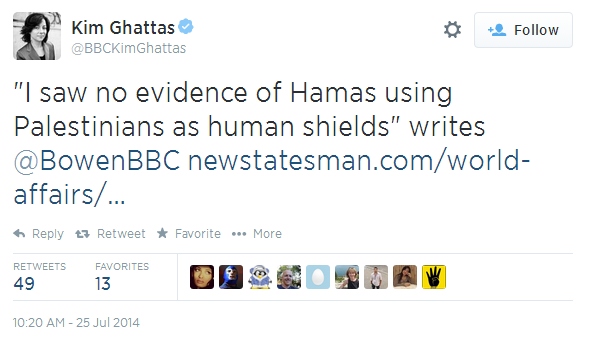 I saw no evidence during my week in Gaza of Israel’s accusation that Hamas uses Palestinians as human shields. I saw men from Hamas on street corners, keeping an eye on what was happening. They were local people and everyone knew them, even the young boys. Raji Sourani, the director of the Palestinian Centre for Human Rights in Gaza, told me that Hamas, whatever you think of it, is part of the Palestinian DNA. Bowen refrains from informing readers that Raji Sourani is far from the impartial human rights campaigner he portrays, but in fact one of those currently leading the lawfare campaign against Israel. Bowen, it is all too apparent, has elected to lend his own clout to that campaign. It is of course worth remembering that those words – and in particular that ‘scorecard’ of suffering – were written by the man ultimately responsible for the accuracy, impartiality and tone of the BBC’s reporting on the Middle East. 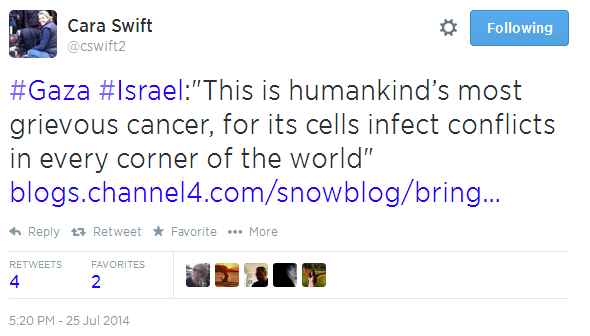 Another article which proved popular with BBC employees was written by Channel 4’s Jon Snow. Snow – who incidentally supports a ‘charity’ banned in Israel because of its ties to Hamas – makes little effort to put up any kind of show of journalistic impartiality either and he too appoints himself as judge and chief awarder of points in the league tables of suffering invented by Western journalists. “I could see the young Israeli IDF guards peering at me through the steel room’s bullet-proof glass. They were the same women who, from another glass window, had barked commands at me though a very public address system. Perhaps predictably, Snow closes by promoting the cringingly uninformed claim that Israel’s battle against a terrorist organization trying to destroy it (a fact he somehow neglects to mention) is in fact the cause of conflict the world over. BBC licence fee payers might reasonably wonder what chance they have of getting anything approaching the accurate and impartial reporting they are promised if these are examples of the type of vitriolic polemics the corporation’s employees read and recommend. They might, however, have already ceased to wonder why so many UK media reports fail to address the topic of the responsibility of terrorist organisations for the suffering of the people of Gaza. It should be remembered that Jon’s relations, Peter and Dan, work for the BBC. Only coward? he is a very educated person! No evidence for using civilians as human shield? Are you for real??? Do you know why you had to go through a bullet proof chambers? Because palestinians tried to kill those people whom suppose to.let the into Israel. You are so blinded and Anti-Semitizm. What would you do if your cities were under daily attack? We saw what you did to the Irish people. So don’t try to teach us about humanity and war crimes. Meanwhile, Duvidl has little confidence the BBC will correct its previous insinuations and report UNWRA’s admission that it was a Hamas misfired rocket that hit the UN school in Beit Hanoun during an Israeli ceasefire. Certainly Sky News TV’s Sherine Tadross (ex Al Jazeera English) reporting from Beit Hanoun tonight, makes no mention of the Hamas misfired rocket she previously suggested was an Israeli shell, nor of whether the bodies she photographs being buried are Hamas terrorist combatants or of combat age. Also, there is no mention of the misfired Hamas rocket or whether the bodies are terrorists on Sky News TV’s press review with Mark Longhurst of Peter Beaumont’s front page story with photo of Beit Hanoun ruins in The Observer, (which is The Guardian’s sister paper).